Okay so I have this guy at work who has a vendetta against me for some reason. He has reported me for hooning (I know because apparently I was doing burnouts in the area I work in) and have since been pulled over. I haven't actually done anything no skids or anything. My car is legal height and has maybe one defect my fault I know working on getting it fixed. Why I'm posting this is because I would like any advise to prove my innocence in this as now I'm targeted everytime I drive my 180. Hey guys So I'm doing a s1 sr20det vct black top conversion. I don't have any of my s13 redtop stuff left. And buying a complete motor box combo. Couple of questions. Will the Gearbox x member of the s14 bolt straight into the s13 body. And also if someone could point me in the right direction on where to find out. What wiring I need to change. Any help on this conversion would be greatly appreciated. Okay guys. Can someone point me In right direction. I have searched and found nothing. I have a s1 s14 sr20det vct motor with the s14 engine loom and ecu. What wiring if any do I need to change. So I'm buying a motor box package from a mate and it comes with prop shaft. It all came out of a s14. My question is will the propshaft fit in my s13?? Okay sweet thanks for that. Sr20det it is then. Hey guys. Couldn't find much info on this question. I have a 1989 silvia it was originally ca18de I then put a sr20det in it and got a mod plate for it. 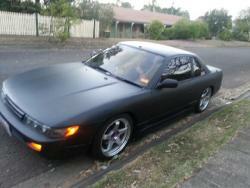 My question is I have recently sold my sr20 to pay so bills when I was Unemployed and still have the shell. With the mod plate already there and I drop a Rb20det or rb25det in it without having to get get a new mod plate. Cheers sorry if it's a noob question. I'm just unsure.